What Theoretically Could Cause a Fringe Shift? What is the Proper Role of Mathematics in Physics? The classical and empirical Doppler Effects of sound and of light both depend upon: 1) relative motion between the source body (which is emitting the sound or light waves) and the receiver of such waves, and 2) the finite velocity of the phenomena (sound or light) being received. From the classical Doppler Effect of light, the relative velocity and direction of motion of the source body and the receiver’s body can be inferred. Einstein’s theoretical, mathematical, and relativistic Doppler Effect of light is conceptually quite different. Empirical methods demonstrate that the classical concept is the correct one. There are two similar physical effects that result from emitted waves and relative motion. These are the classical and empirical Doppler effects of sound waves and the somewhat different Doppler effects of light waves. They will become relevant when we discuss the real reasons for the Michelson and Morley null results in Chapter 12. They will also be crucial to our discussion and scrutiny of Einstein’s mathematical and relativistic Doppler concepts described in Chapters 31 and 37. In 1842, Austrian physicist Christian Doppler (1803 – 1853) discovered an effect relating to sound that resulted from the relative linear motion of a source of sound waves and a distant listener (Zeilik, p. 201). The best way to describe this effect is by an example (Figure 8.1A). When a stationary vehicle on Earth blows its horn with a constant force, the horn vibrates the air around it. As a result, equidistant spherical wavefronts of vibrating air (sound) are emitted in all possible directions from this stationary source body at the finite speed of 1125 km/h (714 mph) at sea level. It takes about 27 seconds for listener A located five kilometers down a straight road to hear the first spherical sound wavefront. Thereafter, each periodic wavefront of sound reaches such listener’s ear at equal time intervals. This constant frequency of received sound wavefronts is perceived by the listener’s ear as a constant pitch. This scenario continues as long as the horn blows and the vehicle and the listener remain relatively at rest. What happens if the above vehicle with its constantly blowing horn then accelerates toward the listener who is 5 kilometers down the road? After a time delay interval of about 27 seconds, the emitted spherical wavefronts of sound will begin to bunch up, and each successive wavefront of sound will be received by listener A during a shorter interval of time than when the horn was stationary (Figure 8.2A). This increased frequency of receipt will be interpreted by listener A’s ear as a shorter wavelength of sound. Thus, listener A will hear a higher pitch (a more shrill sound) than before. After such vehicle has passed by listener B, the successive spherical wavefronts of sound are spread apart and received by listener B during longer intervals of time (Figure 8.2B). This decreased frequency of receipt is interpreted by listener B’s ear as a longer wavelength of sound. Thus, listener B hears a lower pitch (a less shrill sound) than before. These effects are called the (acoustical) Doppler effect of sound (Resnick, 1992, p. 458). The acoustical Doppler effect does not really occur for a distant listener who is located perpendicular to the transversely moving vehicle. Why? Because in this scenario the horn and listener C remain (more or less) relatively at rest, and the spherical wavefronts of sound continue to reach listener C’s ear during substantially constant time intervals (Figure 8.2C). What happens if, instead of the horn moving, the listener moves toward the relatively stationary horn? The equidistant spherical sound wavefronts are immediately received more frequently by listener A’s ear during lesser time intervals, and this greater frequency of receipt is interpreted by the listener’s ear as a shorter wavelength or a higher pitch (Figure 8.1B). In this scenario, the Doppler effect is exactly the same as when the horn was moving linearly relative to the stationary listener (Figure 8.2A), except that (very importantly) there is no delay interval of time for the effect to occur, because the wavefronts of the horn’s sound are already at listener A’s ear when he begins to move toward the source (Resnick, 1992, pp. 457 – 458). 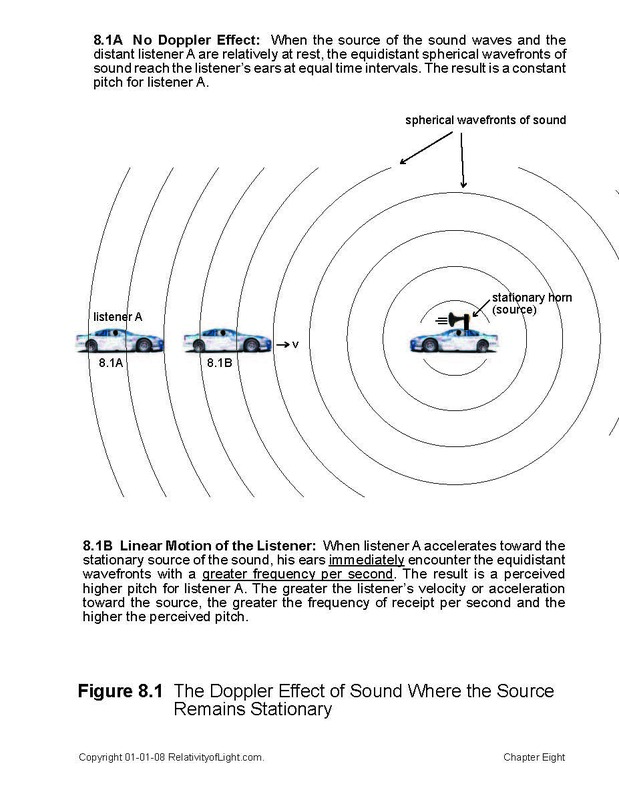 Thus, with the Doppler effect of sound, there are two physically distinct situations depending upon whether the source body or the receiver is doing the moving. 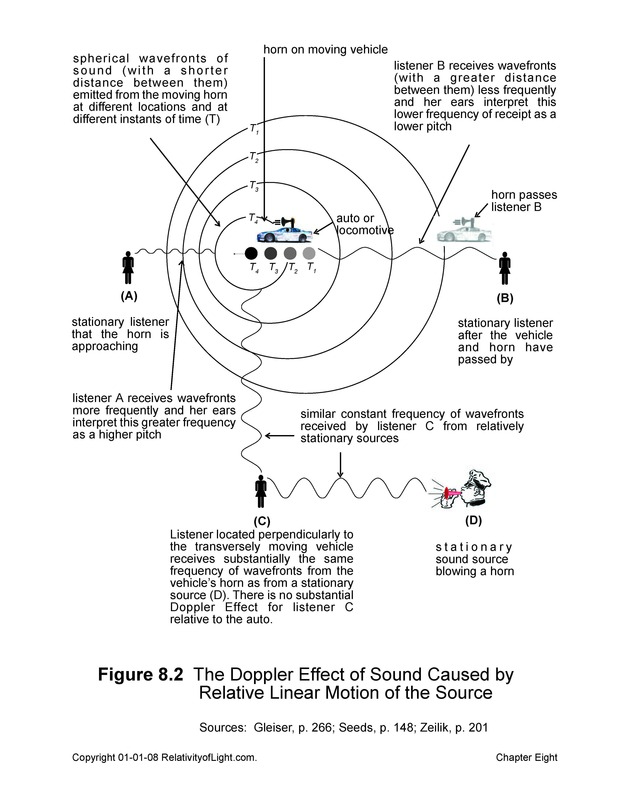 If the listener moves toward or away from the source of the received sound waves, the Doppler effect is immediate. However, if the distant source of the sound moves, then the Doppler effect is delayed during the interval of time that it takes for the finite speed of the sound waves to travel the distance from the source body to the listener. In 1848, our old friend French physicist Armond Fizeau discovered and correctly described a very similar optical Doppler effect for light waves (Hearnshaw, pp. 143 – 145). The Doppler effect of light in empty celestial space is very similar to the acoustical Doppler effect in air, with the following four exceptions: 1) instead of spherical wavefronts of sound, there are spherical wavefronts of light emitted by the light source; 2) instead of a change in pitch, a “shift of dark spectral lines” is observed in the spectroscope of a telescope; 3) the finite velocity of light at c is vastly greater than the finite speed of sound; and 4) very importantly, in most cases there is no way to tell whether the light source or the observer is doing the relative moving. Thus, in most cases, we can only infer (from the observed spectral shift) the approximate relative velocity of approach or separation between two linearly moving luminous bodies in empty space, and the general direction (approach or separation) of such relative linear motions. 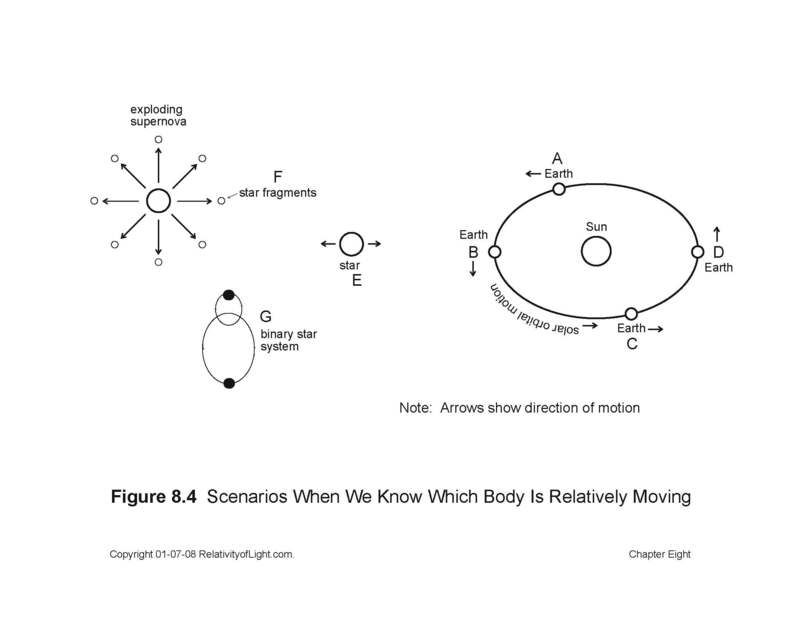 In most cases, we do not know which luminous body is moving, what relative distance, in what specific direction, or when such relative linear motion began. The Doppler effect of light does not occur because of a physical change in wavelengths occurring at the light source. Likewise, nothing that occurs at the position of the observer causes a change in the intrinsic properties of the light (i.e. a physical change in its wavelength). Similarly to the acoustical Doppler effect, the Doppler effect of light only occurs because of relative motion between two celestial light sources as perceived by an observer on each relatively moving light source (Dingle, 1940, pp. 49 – 50). 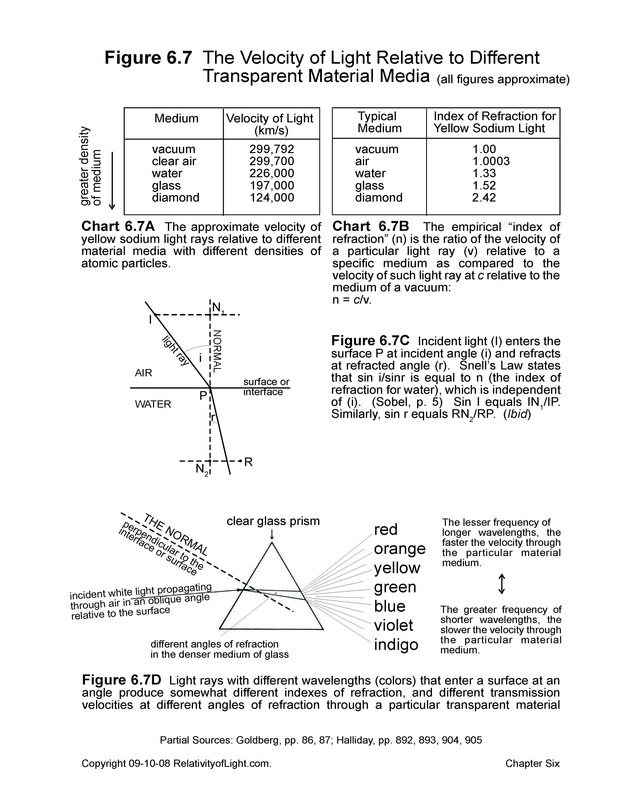 Before we further discuss the Doppler effect of light in detail, let us first discuss what is meant by a “shift of dark spectral lines.” Light received on Earth from a luminous body in space (i.e., a star) through a telescope “is a composite of many individual colors or wavelengths” (Hubble, 1942, p. 102). When this composite light beam passes through a glass prism, the individual light rays are bent (refracted) and their colors are separated out (according to their individual wavelengths) in an ordered and visible rainbow-like spectrum (Figure 6.6C). From the longer wavelengths associated with the red end of the rainbow-like spectrum, the wavelengths of light progressively diminish in length to the shorter wavelengths associated with the blue and violet end of the rainbow-like spectrum (Figure 6.7). Hence, the color of a “position in the [rainbow-like] spectrum indicates the wavelength of [its] light”(Hubble, 1942, p. 102). In the Earth laboratory, each atomic element evidences its own unique signature of colored spectral lines that are part of a normal rainbow-like spectrum. For example, in the Earth laboratory the element calcium is identified by two blue-violet colored spectral lines (called ‘H’ & ‘K’ lines) in the blue-violet section of the normal rainbow-like spectrum (Figures 6.7 and 8.3A). However, when calcium on a nearby star is vaporized by the intense heat of the star, the two blue-violet (H & K) lines of ionized calcium atoms are absorbed by the hot incandescent atmosphere of the star. They are not received by a spectroscope attached to a telescope on Earth as thin violet spectral lines in the rainbow-like spectrum received from such star. In their place are seen two dark spectral lines called “absorption lines” (sometimes called “Fraunhofer lines” after their discoverer), which indicate that ionized calcium atoms have been absorbed into the star’s incandescent atmosphere. In a like manner, the star’s rainbow-like spectrum may also show numerous other patterns of dark absorption lines which indicate that other atomic elements are also vaporized and absorbed in the atmosphere of the light source. When all of these dark absorption lines are superimposed upon the star’s rainbow-like spectrum of visible light, the resulting total pattern of dark absorption lines is called an “absorption spectrum” (Hubble, 1936A, pp. 32, 33). Thus, every incandescent or luminous object in space has two types of spectra: a continuous rainbow-like spectrum and an absorption spectrum of dark absorption lines superimposed upon it. As described by Hubble: “…the [Sun’s] solar spectrum is a continuous [rainbow-like] spectrum on which is superimposed a pattern of dark…lines” (Hubble, 1942, p. 102). In the empty space of the Milky Way Galaxy, the absorption spectrum of each luminous body (i.e. star) often remains at or close to its normal location on its rainbow-like spectrum (Figure 8.3A). However, sometimes the entire absorption spectrum of a star or other celestial body in such nearby space can be observed to be abnormally and uniformly displaced or shifted somewhat toward the red end or the blue end of its rainbow-like spectrum. If the absorption spectrum shifts toward the red end of the rainbow-like spectrum, this “light shift” phenomenon is called a “redshift” (Figure 8.3B). On the other hand, if the absorption spectrum shifts toward the blue end of the rainbow-like spectrum, this phenomenon is called a “blueshift” (Figure 8.3C). “There are a few binary stars, whose orbital motion is observed in the telescope which show corresponding spectrum shifts. Terrestrial experiments, made with light reflected from moving mirrors give similar evidence” (Ibid, pp. 24 – 25). There is also more recent observational evidence that such empirical relationship of magnitude of light shifts and relative linear velocity does in fact exist. 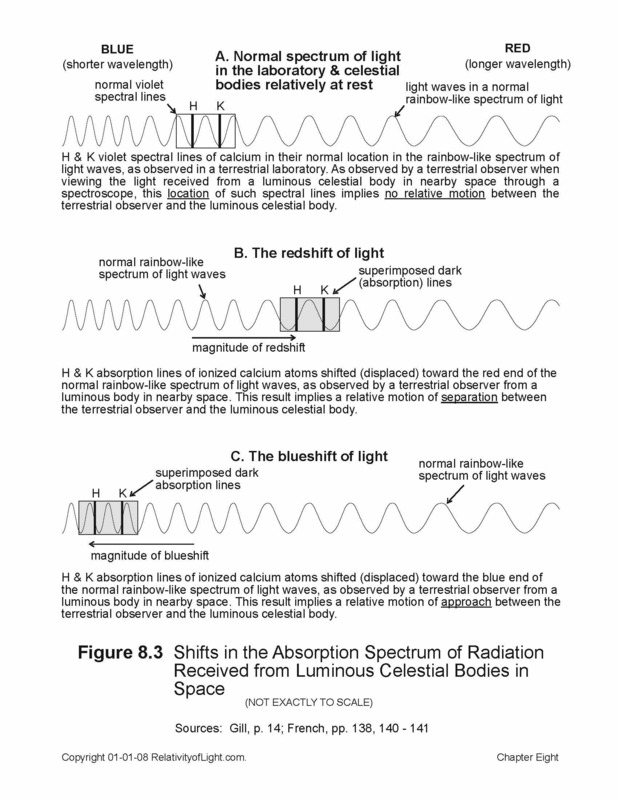 Thus, the Doppler effect of light, in its simplest form, is merely the observed or implied empirical relationship between: 1) the relative linear velocity of a celestial light source and a terrestrial observer, and 2) the magnitude of the absorption spectral shift of that light as seen by such observer (Dingle, 1972, p. 215). If there is no relative linear motion (i.e. if both the light source and observer are linearly relatively at rest, such as the Earth and the Moon), then there will be no Doppler effect. If there is a relative linear motion of approach between two luminous celestial bodies in nearby space, then the dark absorption spectrum will be observed to shift toward the blue (or shorter wavelength) end of the rainbow-like spectrum (Figure 8.3C). This “blueshift” effect is interpreted to mean that the light wavefronts received from the light source have either : 1) bunched up because of relative linear motion of approach by the source body, or 2) they are already at the eye of the observer and are received more frequently because of the relative linear motion of approach by the receiving body (Gill, pp. 14 – 16). In either event, such wavefronts are being received more frequently by the observer during a certain time interval. On the other hand, if there is a relative linear motion of separation between two luminous celestial bodies in nearby space, then the dark absorption spectrum will be observed to shift toward the red (or longer wavelength) end of the rainbow-like spectrum (Figure 8.3B). This ‘redshift’ effect is interpreted to mean that the light wavefronts received from the light source have either : 1) spread apart because of the relative linear motion of separation by the source body, or 2) they are already at the eye of the observer and are received less frequently because of the relative linear motion of separation by the receiving body (Ibid). In either event, such wavefronts are being received less frequently by the observer during a certain time interval. C. Which luminous body is doing the moving? How can we tell from observation whether the distant light source or the terrestrial observer (the Earth) is doing the moving? In most cases, we cannot. Yet there are a few situations in which we can. For example, in the following scenarios we empirically know that the terrestrial observer (Earth) is doing the relative linear movement. Every six months we on Earth alternately observe blueshifts and then redshifts from the light received from many stars (i.e. star E), so it is logical to infer that such spectral shifts are due primarily or solely to the solar orbital motion of the Earth (Dingle, 1972, pp. 216 – 217; see Figure 8.4). 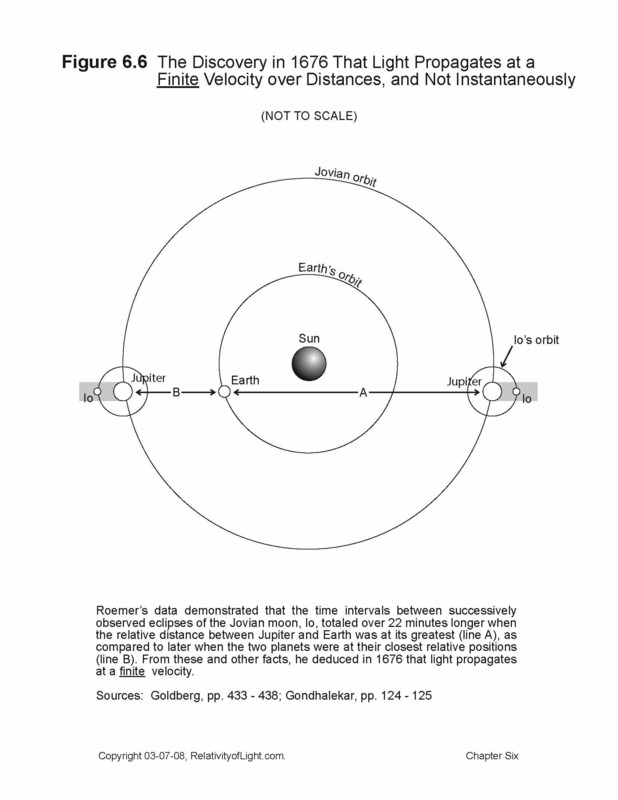 Such light shifts are perceived immediately depending upon the relative linear direction of the Earth’s solar orbital motion (either direction A or direction C). Where the terrestrial observer is doing the moving there is an immediate Doppler effect of light, because more or less frequently received wavefronts from the light source (i.e. star E) are interpreted by the spectroscope to be shorter or longer wavelengths, which results in spectral blueshifts or redshifts respectively. In both of these situations there is no time delay for such Doppler effect of light, because the light waves from the relatively stationary distant light source are already at the eye of the terrestrial observers (Ibid ; Figures 8.4A, C and E). Just as with the Doppler effect of sound, where the observer (listener) is moving linearly relative to the source, the empirical effect is immediate (Figure 8.1B). There are also a few situations where we know that the distant light source is doing the relative linear movement. For example, it is not until the instant that we observe a distant exploding star or supernova (which occurred thousands of light years ago), that we also observe a large blueshift associated with its fragments approaching the Earth at about 2,000 km/s (Figure 8.4F). In this case, we can reasonably infer that it is only the light source (exploding star) and its fragments that are doing the relative linear moving. Likewise, when we observe distant binary stars orbiting each other (with motions that are linear relative to the Earth) and simultaneously alternating redshifts and blueshifts that are exactly in sequence with such inferred relative linear motions, it is obvious that it is the linear motions of the binary stars that are primarily causing the alternating light shifts, not any substantial relative linear motion of the Earth (Figure 8.4G). There are other examples where we can empirically determine which luminous body is relatively moving linearly, such as the previously explained alternating redshifts and blueshifts associated with linearly moving sun spots, planets, moons, etc. (Dingle, 1961, pp. 24 – 25). In all of these situations where the distant light source is doing the moving, the wavefronts of light from the distant light source do not reach the terrestrial observer until the light emitted by the distant source at the finite velocity of c has traversed the distance between them. Just as with the Doppler effect of sound, when the distant source is moving linearly relative to the terrestrial observer (listener), no light shift effect can be seen by the terrestrial observer until after this interval of time delay . For these reasons, such light shifts are certainly not immediate for the terrestrial observer. It thus becomes obvious that in the classical explanation of the Doppler effect of light, there are physically distinct situations where we know whether the source or the observer is relatively moving linearly.